This week, Google dropped the "beta" moniker off Google Music, and with that, it's announced a music store baked into Android Market, much like it has previously done with books. 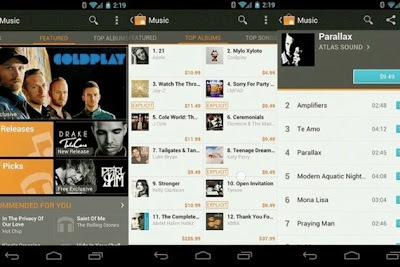 Google Music is available to anyone in the US, no invitation required, and has the ability to upload up to 20,000 songs to the cloud for free. There will be an app for Windows, Mac, and Linux devices that'll help you upload songs to your locker. Those can be streamed via the cloud or alternatively you'll be able to "pin" songs for offline listening. The big news, of course, is the Android Market music store. Millions of song will be available and sortable by genre, sub genre, top albums, and top songs. There are Staff Picks and a New Releases section — standard stuff. Songs look to be in the range of $0.99 and $1.29. Every song is 320kbps MP3, with 90 second previews for each song. There's universal search in the market. Tracks will appear instantly in your Music Library in the browser as well as Music Manager. A new free song every day — first up is David Bowie's "Sound and Vision." There'll reportedly be hundreds of free songs from the get-go. 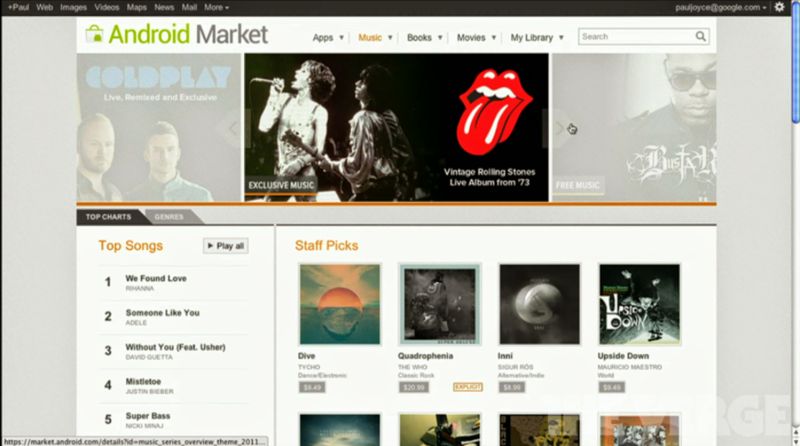 "Antenna" is a section for emerging artists that the Google Music staff — "music geeks" by their admission — love. The Google Music site will have video interviews and other exclusive content (e.g. Coldplay) that they're calling "Magnifier." As rumored, the big major labels include Universal, EMI, and Sony music, and a number of smaller, independent labels. Overall, Google claims to have over 1,000 labels and 13 million tracks, with 8 million of those available today. Six never-before-released Rolling Stones concerts will be on Google Music (one now and five rollout later this year). Busta Rhymes will be debuting his new album exclusively, with a new single coming today. Coldplay, Shakira, Pearl Jam, and Dave Matthews Band, too, will also provide exclusive concert. There will aslo be Artists Hubs as part of the experience, for musicians who want to make customized pages. They can upload and sell their music through Google — almost like an independent label. There's a one-time $25 "artist registration fee." The artists control the pricing for each song, and the split is 70 / 30, with Google taking the smaller share. The songs can be sold directly against their YouTube channels. Google's going big on Google+ integration. You can share a song with a friend and they'll get to hear the entire song — not just 90 seconds. T-Mobile has become the first carrier to let you buy music and add it to your phone bill — just like you can with apps. T-Mobile claims to have exclusive content for its Android-based customers through the end of the year. Android 2.2 and above devices should start seeing the music store for Android as it rolls out over the next few days.